EUGENE – Probably the most interesting takeaway from last night’s TrackTown Tuesday meeting at the Valley River Inn was Prefontaine Classic meet director Tom Jordan’s revelation about the men’s 10,000 meters on Friday night at Hayward Field. Jordan said world record-holder Kenenisa Bekele requested a 13-minute, 18-second pace for the first 5,000. It already figured to be a good race, with the Nike Oregon Project’s Mo Farah pointing to it as his first, significant outdoor competition of the season. 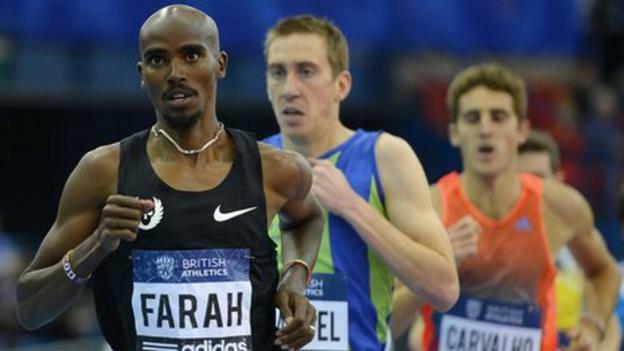 Farah, of course, won gold in the 5,000 and 10,000 at last summer’s London Olympics. Farah, a British citizen, had the London crowd pulling hard for him in the Olympics. Undoubtedly it was a factor in the outcome of both Olympic finals. Farah resides in Portland. Will the Eugene fans get behind him in the same way? It’s going to be interesting. Eight of the runners expected to toe the start line have personal records under 27 minutes. This should be one monster of a way to get the Pre Classic rolling. Remember, the Friday action is free. The main portion of the meet begins at noon on Saturday. This is going to be sooo legit. If there’s a feed, I will record it. Does anyone know if runnerspace has plans on putting the race up? Or is there licensing issues? I’d imagine they should be able to since the 10km isn’t a DL event. But I don’t know if they’re even going to be in Eugene. Apparently there will be streaming on the Pre Classic web page (not the DL page). Later on in the link I posted, the Oregon website states friday is ‘free’ for streaming, but the main event on saturday won’t be. Presumably they have the Diamond League viewing package for sale (international), and possibly runnerspace (always been closely associatted with pre classic). I can’t tell which will be the best distance race, they’re all so stacked. Amos is out with an injury, but everyone else from the final is there. Kaki is also missing, right? I’ve never heard of Gabius. Is he a rabbit? My bad, didnt hear about Amos. The Farah/virus stuff could actually be true. As the Letsruns Neanderthals were talking about, trans-Atlantic flights can do that. The other thing that caught my eye in the Letsrun postings was this apparent request by K. Bekele for 13:18 through the 5km. Any word on whether this is true? Oops. Sometimes I skim where I should read. Apologies. i would argue the field is just as deep in the 5000 and maybe even a tad bit deeper. Bekele isnt NEAR the force he used to be. I agree with USN on the depth of the two events. Plus, hopping into a track 10km a week after running a 10km on the roads probably doesn’t appeal to many people. I know the roads and flats tend to be more forgiving than a track and spikes, but two 10km’s in back to back weeks probably isn’t wise. Edit: As USN points out, *Bekeles, potentially. im going to predict that tariku beats his big brother by a minimum of 7 seconds. Britain's double Olympic champion Mo Farah is outsprinted at the end of the 5,000m in his first Diamond League race of 2013. Still a little unclear what you’re getting at here. That he didn’t have a stomach virus? That stomach viruses aren’t legit reasons to change events?